The oil paints recipe is the manufacture of a medium or oily binder. Once we have the binder, with this and pigments we will join it with a spatula or a crutch leather on a good support. The oils can be stored in empty paint tubes that we can close at the bottom. 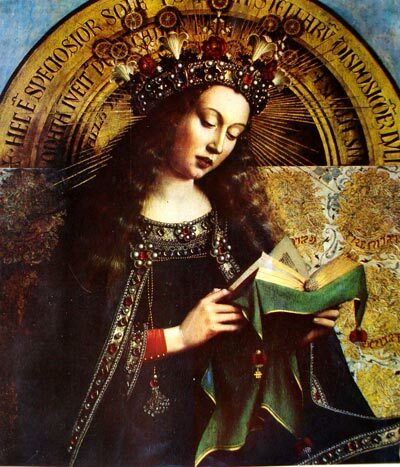 Virgin of Van Eyck, painted in oil. 100 cm3 of Dammar Varnish. 50 cm3 of boiled linseed oil. 5 cm3 of Venice Turpentine. 1 g of Virgin Bees Wax dissolved in Turpentine. We must break or snack the Dammar varnish until the stones become a powder as fine as possible. We add turpentine into the glass jar and with to powder of dammar. We cover it all and exceed by several centimetres. Once we have our dammar varnish, add the amount of linseed oil and virgin wax. The amounts depend on the pigment we are goint to mix. Mix well and this is our home oil binder. palette knife or other utensils. Finally the mass of oil is stored in empty tubes or flasks, but closing the container very well to prevent drying paint. According to which color we create, the binder of oil will need a different percentage of linseed oil.